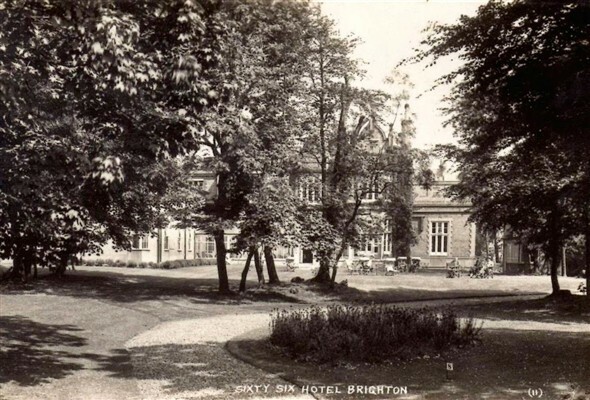 The grounds behind the hotel in the 30s. Behind the photographer was a pond, the gardens becoming progressively more wild and wooded. If you look at this photograph, I think it will give you an idea of the feel of the place- it is a lovely view. As far as I recall, it did not change at all right up to the closure in 1969-70. The rather bland extension was added in the 1930s, along with the sun lounge. It could not have been much earlier, as it was one of those Crittall metal framed jobs which clicked and creaked in the hot sunshine. Through the double doors was the entrance into the hotel’s dining room, which occupied the ground floor bay to the left of the entrance. It was large, light and airy. To the right hand side, by contrast, was the lounge. This was rather sombre, with all its Victoriana intact. It was all red flock wallpaper with heavy mouldings and Lincrusta, all painted in a yellowish cream gloss. I found it a bit stifling, especially with the fire lit. In front of that bay in the sun lounge, not were the stairs down to the underground games room, bar and ballroom. It was dark and as spooky as anything down there, but I always felt compelled to wander around anyway. I must have been crazy, but it was almost like I was daring myself to do it. Anyway I never saw any ghosts, but let us just say, I was very aware of the people who had once danced the night away there in the years before it became unused, forgotten and cobwebbed.